field recordings, beach trash, weather radio, delay, etc. Beginning early on the morning of Sunday, September 20, 2009, the Glass Bees explored areas along the coastline of southeastern Brooklyn, including Dead Horse Bay, Floyd Bennett Field, Gerritsen Beach, and Sheepshead Bay, documenting them with sound recorders, photographs, watercolor sketches, and video, and collecting distinctive objects. Our focus was on terrain that has been identified as likely to experience severe flooding in the coming decades due to the effects of climate change. 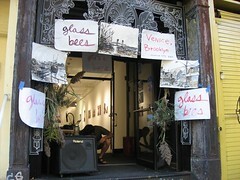 As part of the 2009 Conflux Festival, we presented an improvised performance later that afternoon on the front vestibule and stoop of Envoy Enterprises, a gallery in Chinatown, New York City. Our field recordings, visual footage, and physical detritus became the raw material for a sound collage and temporary installation. Amplified sound was broadcast into the street, and visitors were invited into the vestibule to listen more closely on headphones. 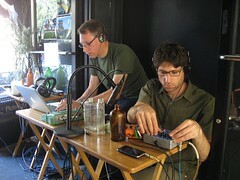 All materials and sounds we presented were gathered, created, displayed, and performed within a 10-hour period. Photographs taken in the field, as well as more photos of the performance (taken by the wonderful Ranjit Bhatnagar) are on flickr; see them as a gallery or as a slideshow. 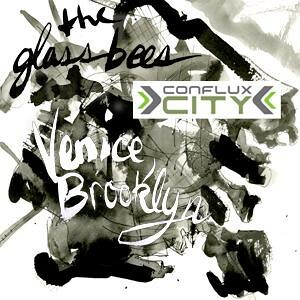 Chris has written a longer reflection on this piece, “Some Thoughts on Venice, Brooklyn“ on his blog. Special thanks to Nathan McKee and everyone at Envoy Enterprises for their support.